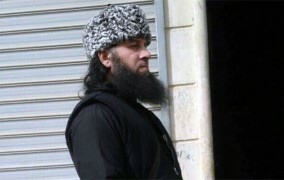 Is JMA Amir Salahuddin the Most Influential Eurasian in the Global Jihad? The Chechen Kist amir of the Jeish al-Muhajirin wal-Ansar, Salahuddin al-Shishani (born Feizullah Margoshvili) recently gave an interview to the Turkish jihadi portal Ummet Islam, which was published on both the JMA’s website, Akhbar Sham, and the CE’s main website, Kavkaz tsentr. Salahuddin was sent as the envoy of the late amir of the Caucasus Emirate (CE) Dokku ‘Abu Usman’ Umarov to the Syrian mujahedin in 2012 along with several other amirs, including the Islamic State’s (IS) northern front amir Tarkhan Batirashvili (aka Umar al –Shishani). The JMA fights alongside Jabhat al-Nusra (JN), with which present CE amir Ali Abu Mukhammad ad-Dagistani (born Aliaskhab Kebekov), has sided, along with Al Qa`ida (AQ), in the struggle for leadership of the global jihadi revolutionary alliance against the IS. The number of JMA fighters was put at 750 in a June 2014 JMA report (http://www.akhbarsham.info/2014/06/18/62/). Thus, Salahuddin now very likely commands more mujahedin than CE amir Dagistani and is in a position to challenge both him and Batirashvili as the premier jihadi amir hailing from Eurasia. In the interview Salahuddin states that he still holds to his bayat (Islamic loyalty oath) to CE amir Dagistani which he gave after the death of amir Umarov, to whom he had also given the bayat. He adds that “if the CE Amir orders him he would drop his duties as JMA amir and go wherever his is instructed to go.” This confirms once again the CE’s ties to the global jihadi revolutionary alliance or movement denied by so many for so long but long ago established in my books and articles. He also supported amir Dagistani against the splitters in the CE’s Dagastan and Chechnya networks, who have defected to the Islamic State or IS (ISIS, ISIL, Daesh), saying that the split would clean the mujahedin’s ranks. Salahuddin also acknowledges that there was a recent assassination attempt aginst him and notes that a Dagestani JMA fighter, Ukkas ad-Dagistani, was killed in the attack. He says that the JMA’s situation and that of other jihadi groups they are in contact with is good and getting better. Coordination between groups in Syria and a joint command center is now in place and is “a real step towards unification” of the jihadi groups fighting in Syria, a process that should not be hrried, he reports. He emphasizes that jihadi scholars have instructed that larger groups should not pressure smaller groups into merging with them. Salahuddin also discusses his new project – a jihad group called ‘Jabhat Ansar al-Din’ (JAD) – which from his description appears to be the name of a united group that includes the JMA and the jamaat ‘Katiba al-Hadra’ that joined the JMA plus the jamaats ‘Harakat Fajru Sham’ (which he says includes many Turks) and ‘Harakat Sham Islamiya’ with which the JMA has been united for “several months.” Salahuddin credits the unification of these jamaats under the JAD umbrella as a result of the the work of amir Mutasim, who heads the JMA’s shariah committee. Salahuddin commented on the JMA’s inclusion on the US State Department’s list of international terrorist organizations with indifference, saying it “absolutely does not worry him.” Asked to comment on JN’s position on the conflict between the IS, on the one hand, and JN, Harakat Akhrar ash-Sham (HASh) and other groups, on the other hand, in Syria and Iraq, he notes that “there is no justification of those who lightly shed the blood of Muslims,” but that JN and JMA “for now do ot seek war with anyne but the infidels” which is their “main task.” He adds that if attacked by anyone, then the attackers “will feel our answer.” Asked about JN and JMA relations with the local population, he said it had imporved after the ‘fitna’ or split with IS. The expanding ties of Salahuddin and the JMA with JN and other groups, exemplified by the JMA’s unification with three new groups in recent months, moves Salahuddin into a position where he can become a rival to IS Northern Front amir Umal al-Shishani (Tarkhan Batirashvili), another Chechen Kist from Georgia’s Pankisi Gorge, as well as CE amir Daigistani, as the most prominent CE operative/Cauasus mujahed in the global jihadi revolutionary alliance. Batirashvili has not been heard from in months, and Dagistani has lost most of his mujahedin to Iraq and Syria with most of those who remain in the North Caucasus having defected (organizationally, though not yet geographically) taking the bayat to IS ‘caliph’ Abu Bakr al-Baghdadi earlier this year. Interview w/JMA amir Salahuddin, “Samoe silnoe chudo – eto priderzhivat’sya istinnogo puti do kontsa,” Akhbar Sham, 20 March 2015, www.akhbarsham.info/2015/03/20/121/ and Kavkaz tsentr, 21 March 2015, http://www.kavkazcenter.com/russ/content/2015/03/20/108429.shtml. See also “Emir Selakhuddin Shisheni: ‘Ummet-i Islam’ in Sorularini Yanitladi’,” Ummet Islam, 31 March 2015, http://www.ummetislam.net/emir-selahaddin-siseni-ummet-i-islamin-sorularini-yanitladi/. “Samoe silnoe chudo – eto priderzhivat’sya istinnogo puti do kontsa”.